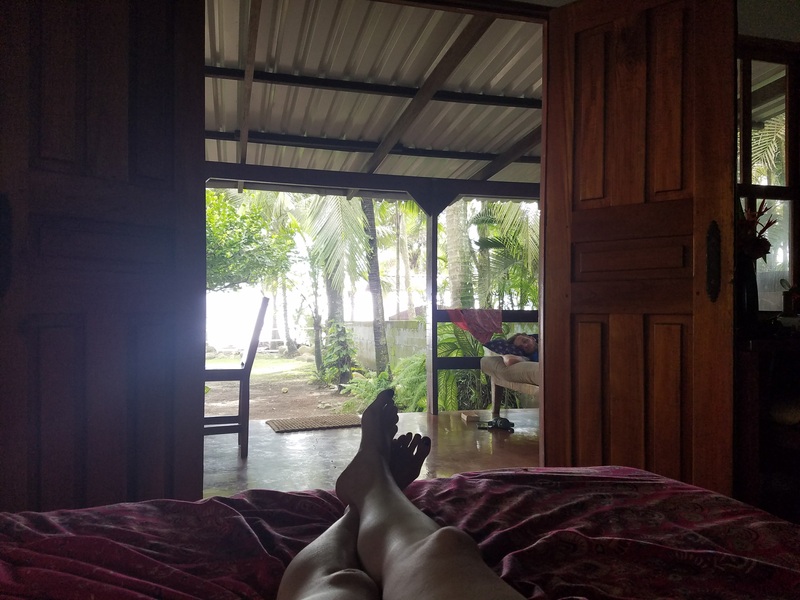 Click here to read Honeymoon Recap – Part 1. The resort was beautiful and quaint. There are 6 individual cottages on the property, each with a kitchenette. 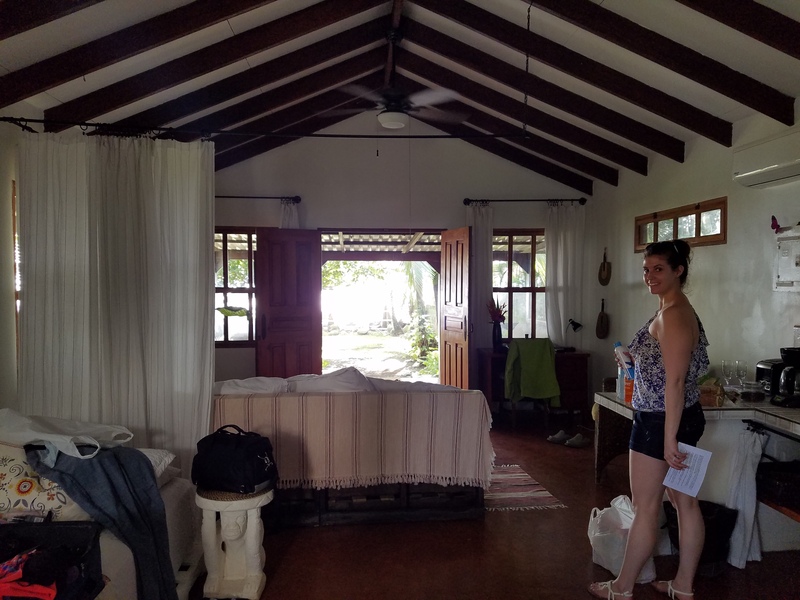 Our cottage, called “Sala de Clases” or “Classroom” in English, was the closest to the beach. We would lie in bed with the double doors open and watch the waves crash on the beach. The beach was about 30 feet from our door. 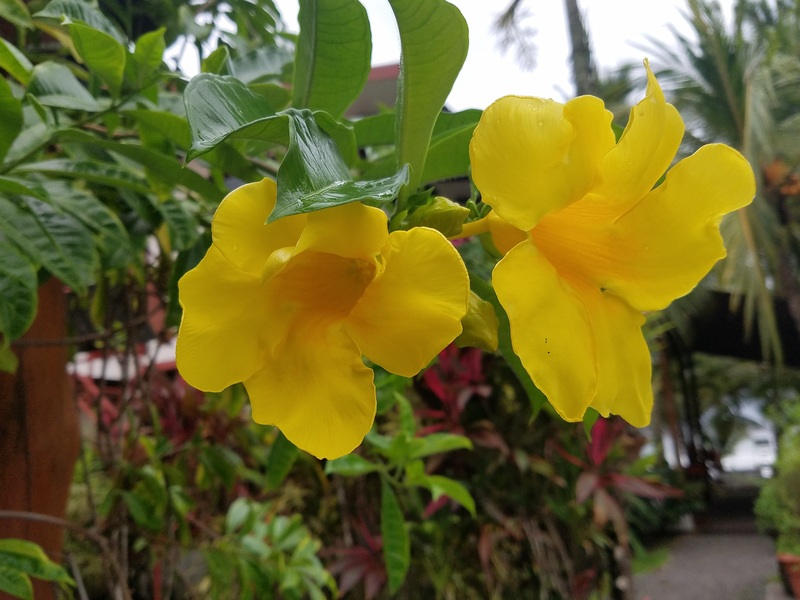 The property was full of florals and vegetation. 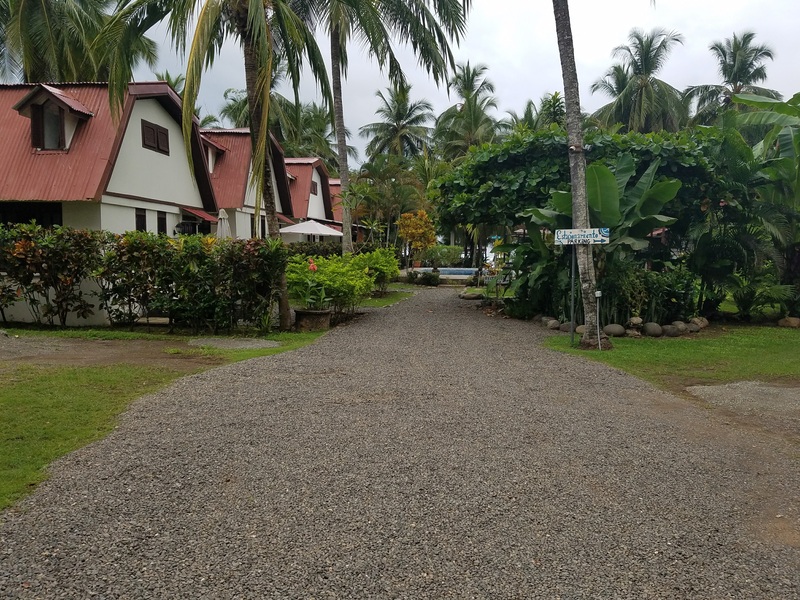 They had a garden with a variety of fruit including pina (pineapple), coco (coconut), limon (lemon), mango (mango), and platano (plantain). All of these were served with breakfast or dinner. 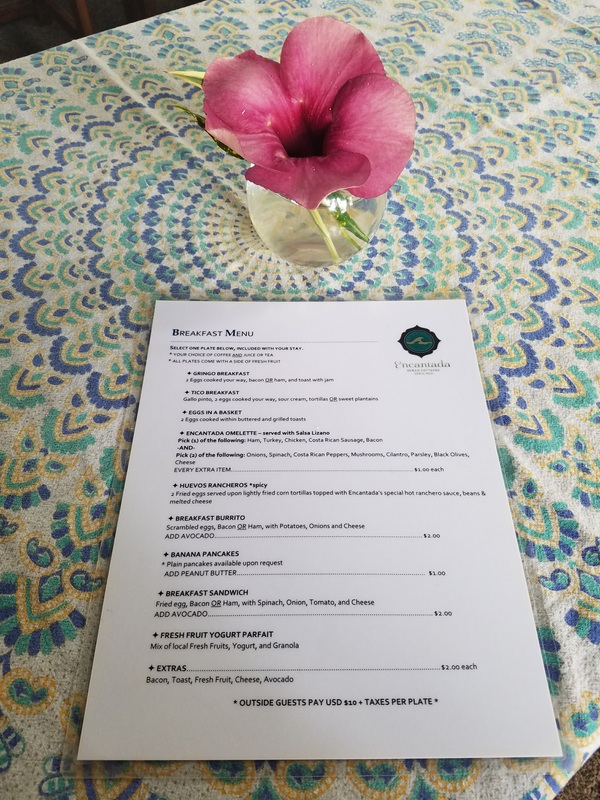 Flowers were picked from bushes or vines on the property and placed in our room and on the tables for breakfast. 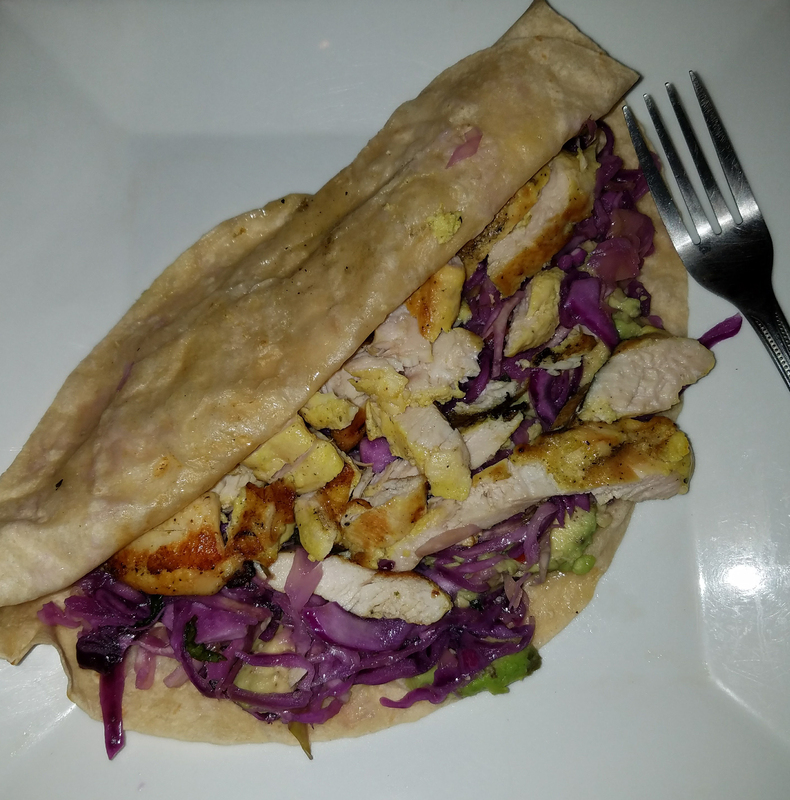 The food at Encantada was AMAZING! Elena, who worked as the chef and housekeeper, cooked everything fresh and with minimal seasoning. It was TO DIE for! 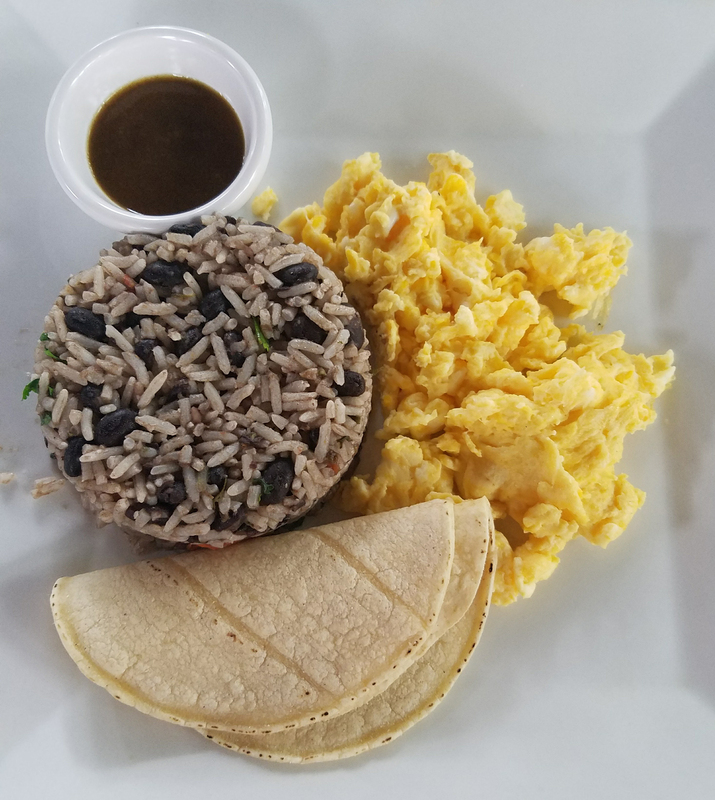 The food wasn’t much different than what we eat at home (rice, beans, fruit, coffee, toast, flour tortillas, chicken, etc). 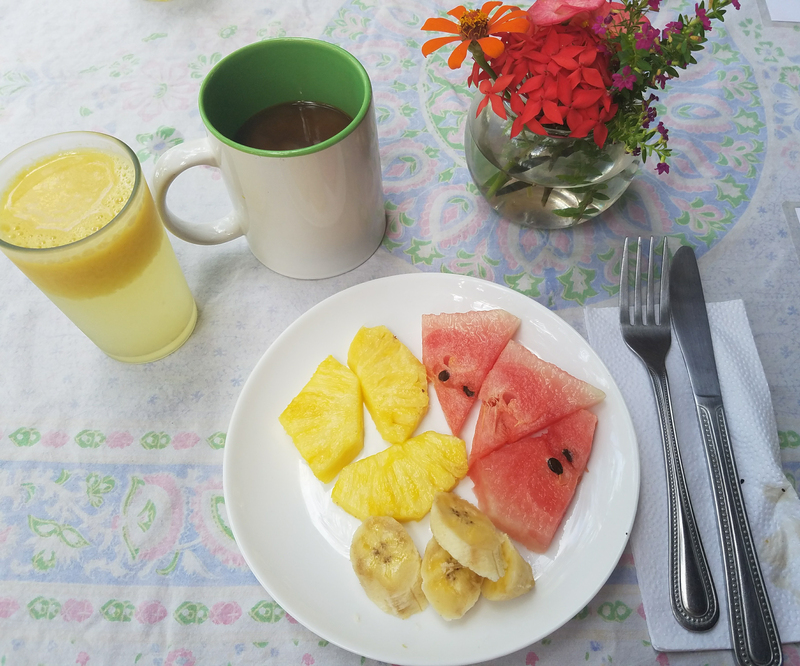 Fresh juice, coffee, and fruit plate to start breakfast…with fresh flowers. 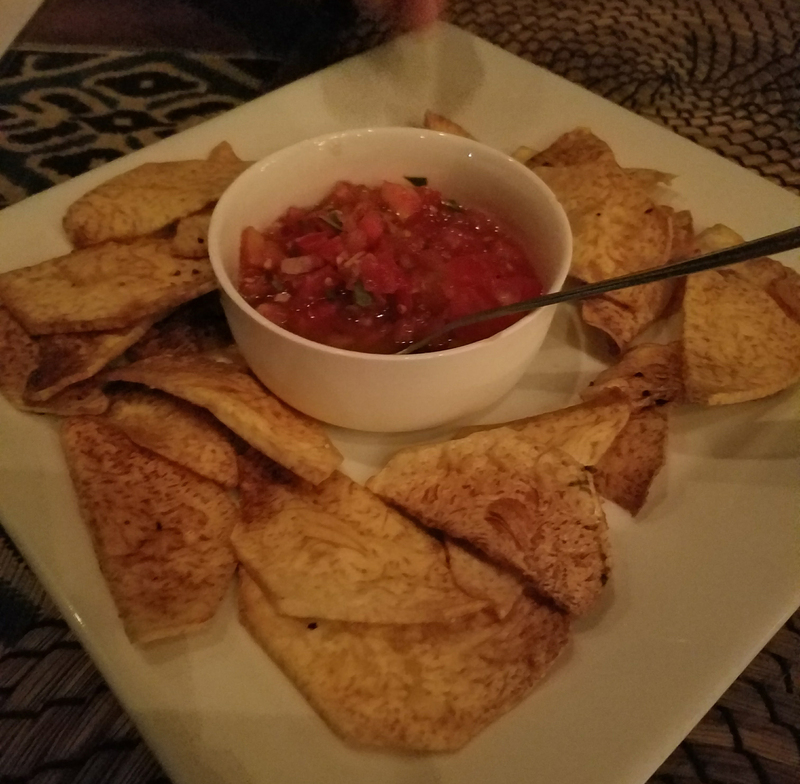 Malanga and Elena’s fresh salsa – my FAVORITE! The resort was pretty quiet Tuesday and Wednesday. It was just us and the staff. Maria worked as the yoga instructor and waitress. She was a graphic designer from Sweden, and traveled to Costa Rica for a yoga certification. 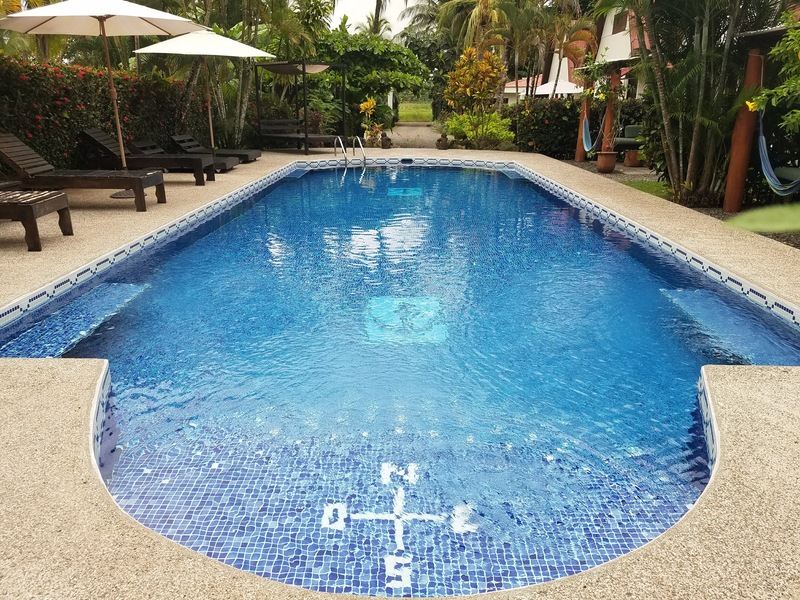 She loved it so much that she decided to quit her job and move to Costa Rica permanently. Adam was the property manager. 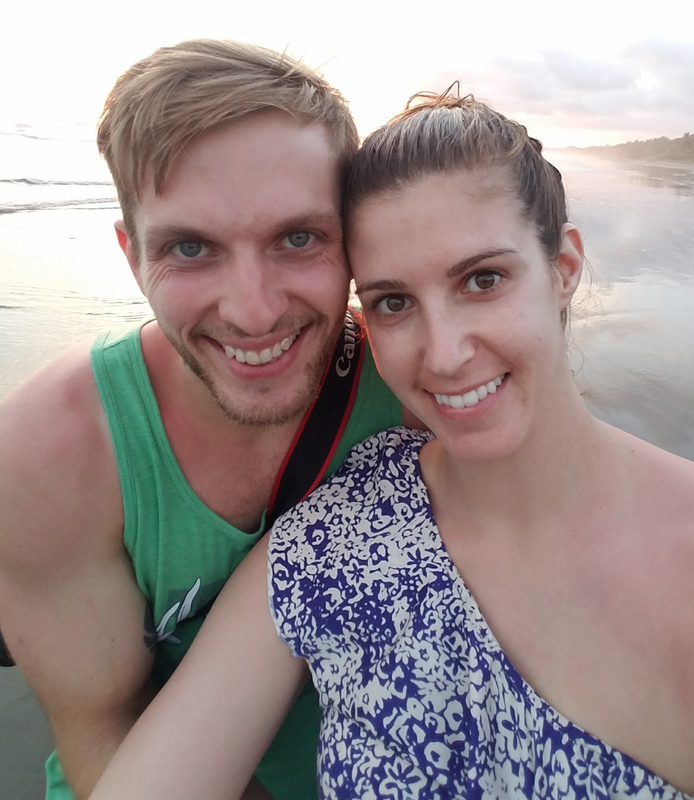 He grew up in California, but headed to Guatemala to work at a 70-person hostel before coming to Encantada. 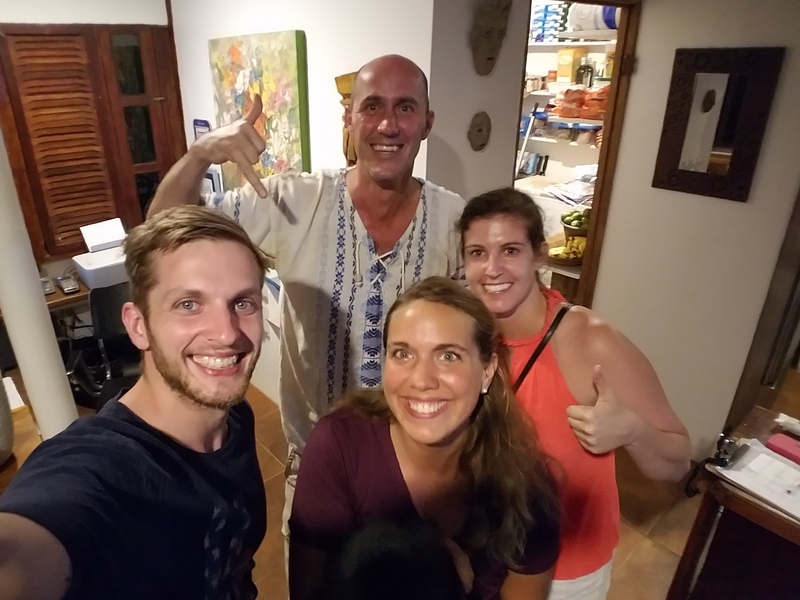 Both Maria and Adam has infectious smiles and awesome personalities. We really enjoyed getting to know them during our stay! Osyrus was a black cat that lived on the property. He was about 2 years old and was very playful. He LOVED Bobby. 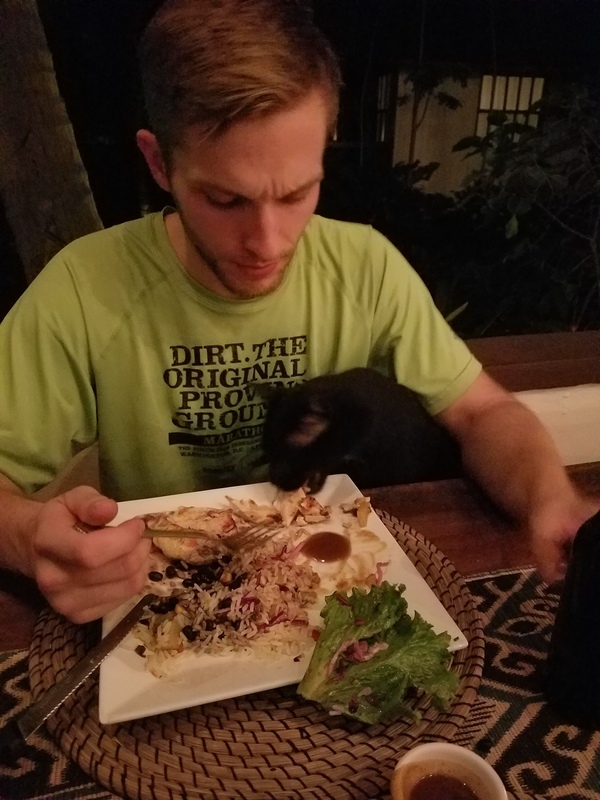 Every time we sat down for dinner, Osyrus would pop his head under Bobby’s arm and try to sneak a bite off his plate. One day, when Bobby and I were reading peacefully in our cottage, Osyrus came walking into our cabina. 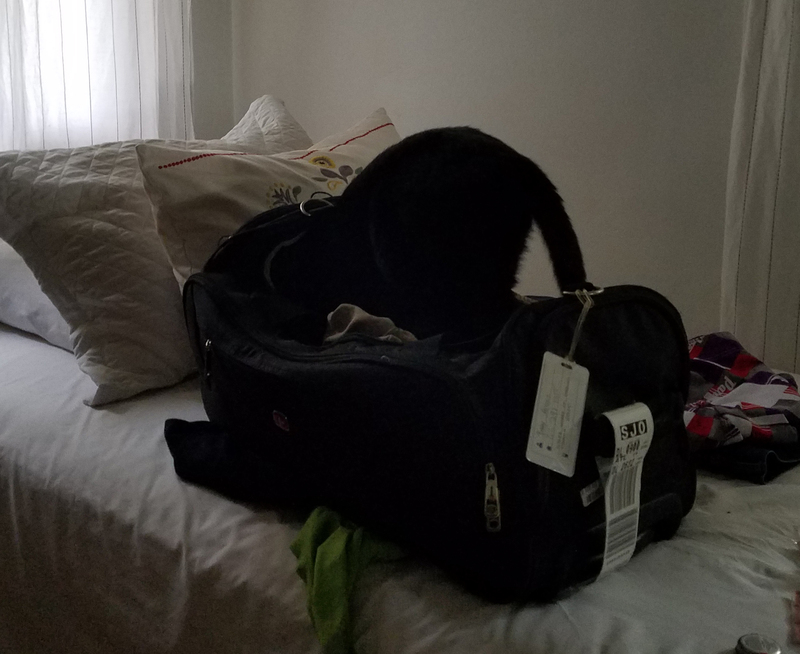 He ended up sneaking into Bobby’s duffle bag! Osyrus sneaking a bite of chicken! 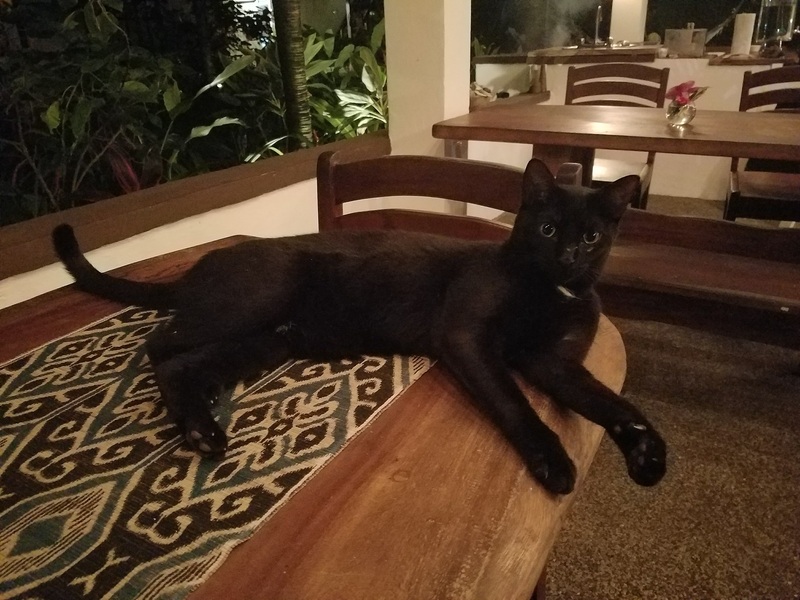 Surprisingly, Osyrus was the only cat we saw during our trip to Costa Rica. I’m sure predators are a big issue, but I figured I would have seen more. We saw a lot of stray dogs. The pet culture in Costa Rica was very different from the US. Most dogs were unleashed, had no collar, and not spayed or neutered. They just walked the beach or along the side of the road. It was difficult for me to not touch any of the dogs…you just aren’t sure what they might carry. We spent a lot of time walking along the beach. We were at the tail end of wet season (meaning it rained every afternoon), so the beaches were bare. We enjoyed spotting crab “artwork”. 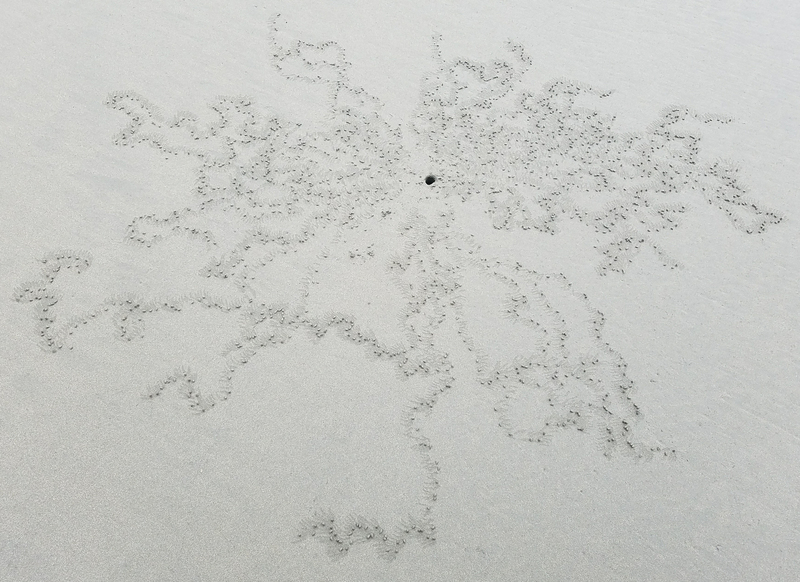 The sand crabs would dig holes and create “beads” of sand in really intricate squiggly lines. There were THOUSANDS of these on the beach. 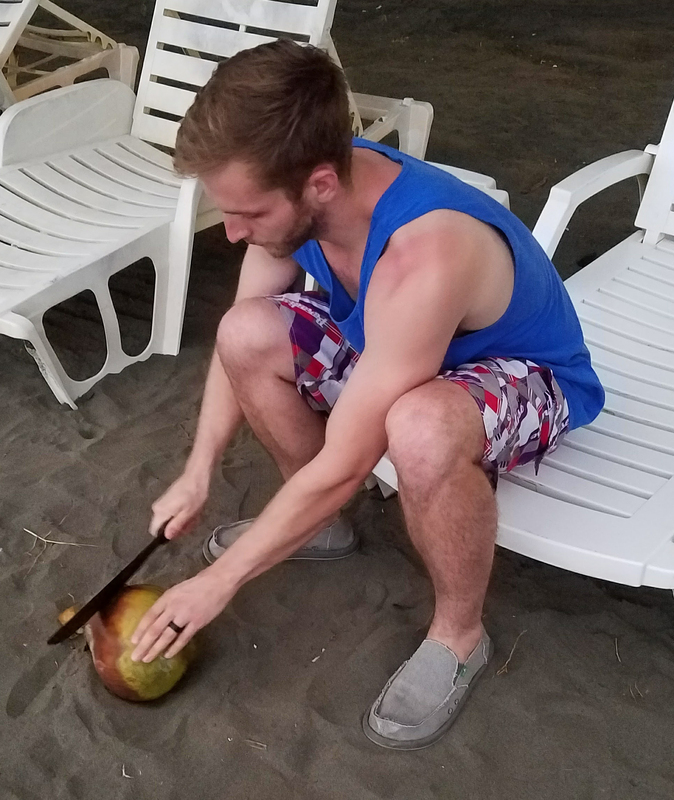 Bobby found a coconut and tried to open it with a machete, only to find that it was sour. 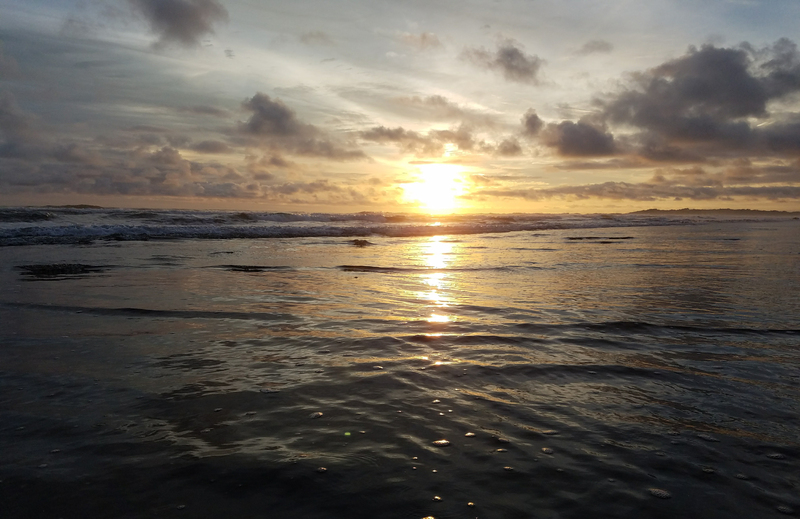 The sunsets in Costa Rica are beautiful! I’ve seen some beautiful sunsets (Hawaii & California), but there was something special about the seclusion on the beach. 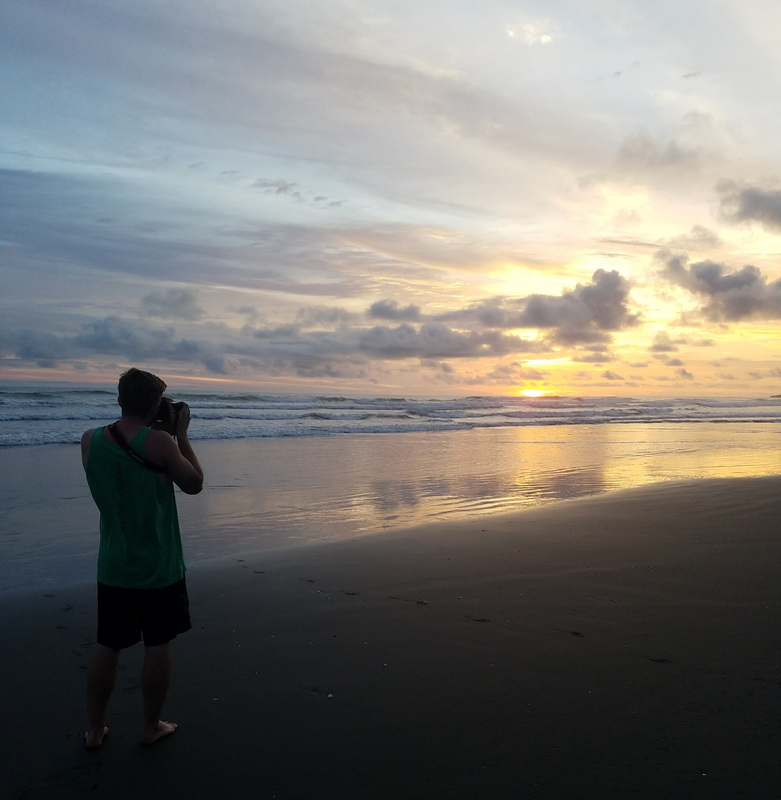 We were lucky to see 2 sunsets during our trip — pretty good odds during rainy season. The first sunset was on our first full day. Next, we’re driving 4 hours north to Arenal Volcano.